We are a Christchur­ch based transport company, servicing the local area - Hand loaded small freight and furniture removals is our specialty. Local Freight Services in Christchur­ch and surroundin­g areas. One off deliveries­, small and large furniture removals . Christchur­ch, Rangiora, Kaiapoi, West Melton, Darfield, Oxford, Leeston, Rolleston. Also Long Haul South Island . Option 2 : $120 + GST per hour 24/7 . for 11 and 19 cubic metre truck (As per photo) for general small or large removal work. Time starts when we arrive at your premises, Minimum 1 hour. We do not charge call out fee's or mileage within the Christchurch area. Additional charges will apply for locations outside the Christchurch area. Hill Suburbs, upper levels with stairs and difficult access locations are $150 + GST per hour. larger 23 cubic metre truck can be organized for extra large removals .And Long Haul South Island. Option 3: $60 + GST per hour for yourself to load the truck which is pictured (We will provide the driver who will stay with the vehicle but no labour is involved.). As per above, Time starts when we arrive at your premises, we do not charge call out fee's or mileage within the Christchurch area. Minimum charge 2 hours. Additional charges may apply for locations outside the Christchurch area . 100% recommendation. Friendly, professional, efficient, flexible, customer focused service. Thank you Mark and team! Mark Robinson: Hi Racheal ,Thank you for you kind review. we enjoyed your move ,You were well organized which made our job so easy. Cheers Mark. Mark Robinson: Hi Steve.Thanks for your review .It is always a pleasure working with those who are well organised.Cheers .Trust 2019 will be a good year . We have used Megalodon twice now and cannot praise them enough. Very professional, friendly and cost effective. They are saved to our Trade Me listings for easy reference! Thank you for your excellent service! Mark Robinson: Thanks Steve. Great to be able to serve you again .Awesome purchase ,Well done .Look forward to your next bargain..And thanks for your generosity we had a drink on you .Cheers Mark. Top Notch Services! Make everything seem so easy. Well done guys. Mark Robinson: Thank you so much for your awesome review .we enjoy doing what we do .And thanks again for letting us move your furniture to your new home. Cheers Mark. Mark & Kenny of Megalodon are fantastic. They collected and delivered a very large and very heavy suite for me from one side of Christchurch to another. They were courteous, friendly and very professional and they don't charge the earth for their services. This is the second time I had used Megalodon; I highly recommend them and would most definitely use them again. should the need arise. Thanks guys. You made everything look so easy. Mark Robinson: Hi Trisha. Thank you for kind review .You made our job so easy ,well organised and perfect timing .and what amazing lounge suite. great buy .And.i bet you are enjoying the comfort. Cheers Mark. Top team - great service - a real pleasure. Mark Robinson: Hi .Murrey. Thank you for your review . The pleasure was ours .well organized boxed and ready to go.made our job so easy .Cheers Mark. No nonsense, no drama, just quality service, picked up two big sofas and delivered when they said they would. Thanks! Mark Robinson: Hi Steve .Thanks for your review .Nice choice ,.fantastic looking sofa. Cheers Mark. Mark Robinson: Thank you Doug .It was our pleasure to help out. You were amazing .made a big job easy. thanks for your help.Cheers Mark. Mark Robinson: Thanks Madeline, Your new bar looks great. See you another day .Cheers Mark. Top service, great communication and very pleasant people to deal with! I was really stressed as I hate moving but this moving service was absolutely fantastic and very good value for money. I cannot thank you enough, you made the transition smooth and easy! Mark Robinson: Hi Monika..Thank you for your review .You made our job so easy . All packed up and ready to go .Hope you are enjoying your new home.It looks great and you have furnished the house fantastic . well done.cheers mark. I live in Auckland and organised Mark to move my Father into a new place in Christchurch. Mark was absolutely wonderful I dealt with him via phone call and text, he fitted Dad in with short notice. Dad could not have been happier said the move went smoother than he could have imagined, thank you so much, my only worry is with all these wonderful reviews you will get too busy! Will defo use again when a friend moves in ChCh in Sept.
Mark Robinson: Hi Sandy. Thank you for your kind review. Dad was fantastic .He was well organised and knew were everything fitted, made our job easy. Look forward to helping your friend in September. Thanks again. ..Cheers Mark. 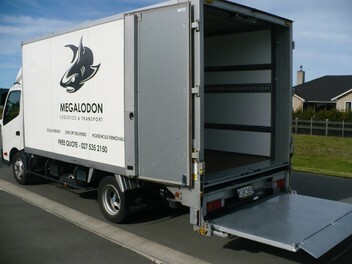 A+++++++ This is the 3rd time we have used Megalodon Transport and what a fantastic moving company. Mark in my opinion is incredibly professional, very friendly, respectful/polite and always on time. We highly recommend this moving company whether it is for small or large removals as they go above and beyond and make any job stress free. Thank you again for your reliable, great value and efficient service, until next time! Mark Robinson: Thank you April .For your encouraging review. Your new furniture looks fantastic in your new home. and thanks for your custom..See you another day .Cheers Mark. Thanks so much Mark! You guys are awesome!! Carefully brought in our furniture and bed! You guys were efficient, and friendly. I highly recommend. Will absolutely be using again! Thanks! Mark Robinson: Hi Anita. Thank you for your kind words and review . It was a real joy helping you into , your new home . Cheers Mark . Absolutely lovely, I can't recommend this team highly enough! They went above and beyond to help me settle in and turn a really stressful day around. Will definitely be using them again for any moves, big or small, that I have in the future! Mark Robinson: Thank you Angela. We really enjoyed picking up all your goods and delivering them to your new house.and what a great little house you have brought.Well done. See you next time.Cheers Mark. Mark Robinson: Hi Lauren.Thank you for your review. Very easy shift. you were so amazingly organised and helpful. made our job so easy and enjoyable on a busy day. Enjoy your new home . .Cheers Mark. Mark Robinson: Hi Ayumi. Thank you for your review. What a great shift,Your team of helpers made our job so easy.Well done.trust you are enjoying your new home.and the shopping next door. Cheers Mark. Excellent company to work with! On time, efficient, and friendly staff. Would highly recommend. Will absolutely be using again! Thanks guys! Mark Robinson: Hi Nita. Thanks for your review. your 3 Piece Suite.was a great buy. well done. See you next time.Cheers Mark. Wow! These guys are great. They arrived promptly and introduced themselves. Despite the weather being horrendous with non stop rain Mark & Kenny took great care with the 3 piece suite I had just bought. They kept it well covered it from the rain while they moved it very efficiently and professionally. They were very respectful towards me and of my house. I most definitely recommend them to others whether for small or large removals. I would most certainly use their services again. Mark Robinson: Hi Trisha. Your 3 piece suite was amazing and well worth looking after..Hope you are enjoying and relaxing in your new suite . Thank you for your kind review. Cheers Mark. Mark Robinson: Hi Felicity. Thank you for your kind review .Hope you are enjoying your amazing home.In paradise .When we are in Methven next. we will drop in ..coffee sounds good. .Cheers Mark. Highly recommended. Awesome friendly movers. Tail lift truck. They used stair climber hand trolley to move the fridge freezer and washing machine safely. Thank you guys.